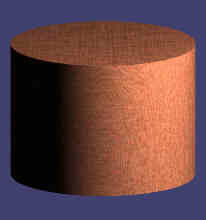 An object shaped like a cylinder is said to be cylindrical. 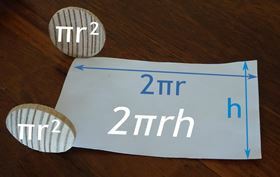 Try it yourself: cut some paper so it fits around a cylinder, then unwrap and measure it. Imagine you just cooked a pizza. 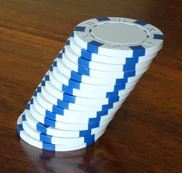 The radius is "z", and the thickness "a" is the same everywhere ... what is the volume? In future, order your ice creams in cylinders, not cones, you get 3 times as much! 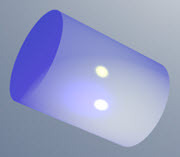 A cylinder is like a prism with an infinite number of sides, see Prism vs Cylinder. And we can have stranger cylinders! 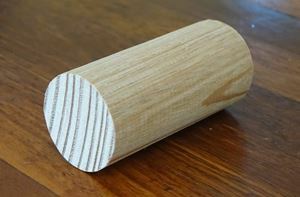 So long as the cross-section is curved and is the same from one end to the other, then it is a cylinder. But the area and volume calculations will be different than shown above. And what we can't we can"